Company announces certification from National Technical Information Services (NTIS). The numerous pension, insurance, finance and government clients who rely on Life Status 360 for critical data can rest easy. Despite industry uncertainty brought by changing regulations, LifeStatus360, LLC says their customers will still have access to data from the Social Security Administration’s death master file. That’s because the company has earned NTIS certification. While the government works toward establishing a set of permanent rules governing database access, Life Status 360 is happy to meet client needs. LifeStatus360 (https://lifestatus360.com/) is among the professional data providers helping shape changes to current access regulations. The Coalition for Death Master File Implementation and Reform is a group of employers, insurers, and information professionals lending their expertise to the ongoing rule making process. Congress could not agree on a new set of access rules by the recent deadline, so NTIS (National Technical Information Services) certification is a temporary measure while deliberations continue. Since 2001, LifeStatus360, LLC has delivered industry leading comprehensive data compliance solutions. 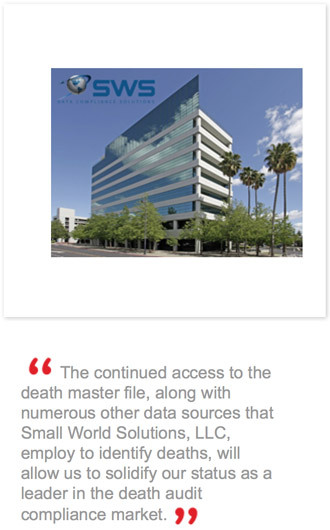 LifeStatus360 was the first company to provide a continuous death audit service, web-based death audit software as a service (SaaS) solution which remains a market innovator. LifeStatus360, LLC supports the pension, insurance, financial, government, and a wide variety of other industry segments. The company’s innovative approach drives creation of comprehensive solutions clients need to meet compliance objectives. Their mission is to identify all data sources to deliver revolutionary, proactive, and sustainable solutions so customers can meet their fiduciary responsibilities. Life Status 360 is committed to combating fraud, waste and abuse, and to create a broader culture of compliance.